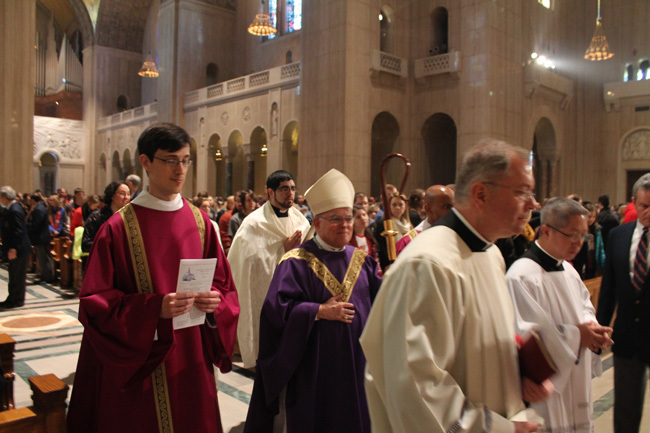 Join Archbishop Charles Chaput on an archdiocesan pilgrimage to the Basilica of the National Shrine of the Immaculate Conception in Washington, D.C., on Saturday, Oct. 28. Pilgrims from the Philadelphia Archdiocese will implore the prayers of Our Lady of Fatima. The program begins at noon and includes confessions, a procession and crowning of a statue of the Blessed Virgin Mary, recitation of the rosary and concludes with a Mass at 3 p.m. with Archbishop Chaput, celebrant and homilist. Interested persons should contact their parish office to join local efforts to fill the national shrine to Mary for this occasion. How I would love to be there ! But God has something else for me to do right now. My thoughts and prayers will be with all of the pilgrims. We have a bus leaving from Mother of Divine Providence Church, King of Prussia. leaving at 7:30 A.M. staying all day and stopping for dinner after Mass. Cost is $65. Try Visitation BVM or St Eleanors, and youre welcome to join our group at St Genevieve but we will not be staying all day. Thank you Father Kevin for the info. I’m interested in going D.C. Pilgrimage. I’m from Florida and used to live in Norristown. Is there a parish bus trip from Norristown?